Cake Decorating is a required course in the Baking and Pastry curriculum offered in proprietary colleges and two-year community colleges. Baking and pastry students take this course typically in the second year of their curriculum. Gisslen's Professional Baking, 3e serves the needs of the fundamental baking course. However, in Baking and Pastry programs, students are more focused on decorating and design. This underscores the need for a book with complete and detailed instructions on decorating methods and techniques. Toba Garrett is head of the Department of Cake Decorating and Design at the Institute of Culinary Education in New York City. She is a member of the International Cake Exploration Societé and former president of the Confectionary Arts Guild of New Jersey. She is also the author of The Well-Decorated Cake, Creative Cookies: Delicious Decorating for Any Occasion, and the IACP Award–winning Wedding Cake Art and Design. 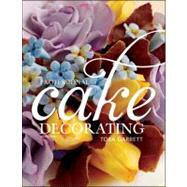 In 2010, Dessert Professional magazine named Garrett one of the Top Ten Cake Artists in America.